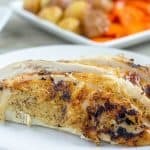 Incredibly moist, tender, and flavorful turkey breast in about one hour! Make sure turkey breast is completely defrosted. Season breast liberally with salt and pepper, making sure to season inside cavity as well. Add remaining ingredients to pot – chicken broth, onions, garlic, thyme, rosemary. (Not pictured: I meant to add a sliced lemon as well, but I forgot.) Place trivet on top of all ingredients. May be uneven and not touch bottom, and that’s okay. Place breast on top of trivet, skin side up. Lock lid and cook for 35 minutes at high pressure. I use the rule: 5 minutes per pound, plus 5 more minutes. There’s nothing worse than undercooked poultry. Once cook time is complete, allow pressure to release naturally (will take almost 30 minutes). Using tongs and a spatula, transfer turkey breast to a baking tray. Place into oven under high broiler until skin reaches desired crispiness. Keep a close eye on it and do not walk away because it can change quickly. Be sure to rotate the breast so that it crisps evenly on all sides of the skin. When ready to serve, be sure to slice against the grain. If you slice with the grain, the turkey will be chewy. Nutritional information for this recipe is misleading. The approximations include calorie and fat content for all of the skin and bones. So your actual consumption will be MUCH less than that. There's just no way to reflect that with this type of recipe card.